Electrostatic Discharge (ESD) is a pervasive issue in the semiconductor industry affecting both manufacturers and users of semiconductors. The problem worsens with each new generation of parts and components. As technology scales to higher levels of integration, circuits become more sensitive to ESD and the design of protection becomes more difficult. 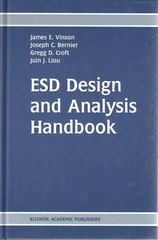 ESD Design and Analysis Handbook presents an overview of ESD as it effects electronic circuits and provides a concise introduction for students, engineers, circuit designers and failure analysts. This handbook is written in simple terms and is filled with practical advice and examples to illustrate the concepts presented. While this treatment is not exhaustive, it presents many of the most important areas of the ESD problem and suggests methods for improving them. The key topics covered include the physics of the event, failure analysis, protection, characterization, and simulation techniques. The book is intended as both an introductory text on ESD and a useful reference tool to draw on as the reader gains experience. The authors have tried to balance the level of detail in the ESD Design and Analysis Handbook against the wealth of literature published on ESD every year. To that end, each chapter has a topical list of references to facilitate further in-depth study. ESD in our world, ESD in semiconductors, The ESD event, Degradation and Latency, Topical reference list. Overview of failure analysis, Failure analysis objectives, Failure site identification, Root cause and corrective action, Topical reference list. Environmental philosophy, room level controls, Work area controls, Personal controls, Packaging and storing, Handling equipment, Auditing, Topical reference list. Protection approach, Off chip protection, on-chip protection, Topical reference list. Circuit element sensitivity, TLP testing, Characterication matrix, Topical reference list.